One of the great marketing campaigns from the 2012 Olympics didn’t come from an official sponsor. It came from a headphone brand called Beats by Dr. Dre. The Beats brand customized headphones in national colors and then strategically sampled them to athletes. Athletes wore Beats everywhere in the games, particularly in swimming. This is “ambush marketing”, a marketing strategy where advertisers capitalize on an event without paying a sponsorship fee. In the 1996 Olympics, sprinter Linford Christie famously wore contact lenses embossed with the Puma logo even though Reebok was the official sponsor. The Olympics cracked down on ambush marketing this year like never before. Branding police looked for violations from small cafes to internet ads. British Parliament even approved a $30,000 penalty to discourage it. But the Beats brand slipped through, even though rival Panasonic is the official audio brand. Beats successfully sampled their headphones because the athletes didn’t see themselves as part of a marketing campaign. They were just using equipment they genuinely liked. The IOC allowed the Beats sampling, saying “there is a difference between someone using equipment with a logo and someone promoting the brand.” The best marketing doesn’t feel like marketing. Official sponsor ads with stereotypical shots of athletes swimming, jumping, and running start to look the same after a while. I like how ambush marketer Nike cleverly skirted the Olympics rules (and bested official sponsor Adidas) with this ad celebrating everyday heroes in places around the world called London. Sometimes great marketing has to break the rules. Brilliant cartoon, and perfectly reflected by the ambush marketing tactics of Beats and Nike. It reminds of what Nike did in the World Cup in Germany. Nike didn’t allow themselves to be excluded by official sponsor Adidas by giving out free caps outside the football stadiums. The result? The spectators put on the caps and gave Nike ad space on the heads of football fans. Brilliant. “The best marketing doesn’t feel like marketing” This is quite accurate and the lesson we can all draw from this. But I’d hate to see everyone start copying this example and turn it into something ugly and overdone. So, I’d like to add: The best marketing is doing something no one else is doing. This is so true every time a big sports event takes place, that identifying the official sponsors becomes more and more difficult, which is a risk to be considered by events organisers. This happened this season in one of FCBarcelona Vs. Real Madrid soccer matches, where Moritz (a local beer from Barcelona) sampled beers and t-shirts right in front of the stadium main gates even though FCBarcelona is sponsored by another brand (Estrella Damm). Very smart, but at least the club wasn’t authorising the sampling! I agree with the IOC position that the Beats program is not ambush and separately know that Nike directly supports Olympic athletes and National Olympic Committees all around the world. And while I enjoy your cartoons each week, I am appalled that you would extol the virtues of ambush marketing, otherwise known as “parasite marketing”. For you to suggest that “great marketing sometimes has to break the rules” is reckless and irresponsible- at least in the context of parasite marketing. Without the support of the official sponsors, events like the Olympics would not exist for parasitic companies to ambush. Great post–makes me think about how the best marketing is something that the consumer WANTS to be part of–something they’re proud to participate in. It’s not something that’s done TO them; it’s something they ALLOW to happen. Statistics show that people’s susceptibility to traditional advertising is decreasing, as we are being inundated with more and more marketing messages every day. 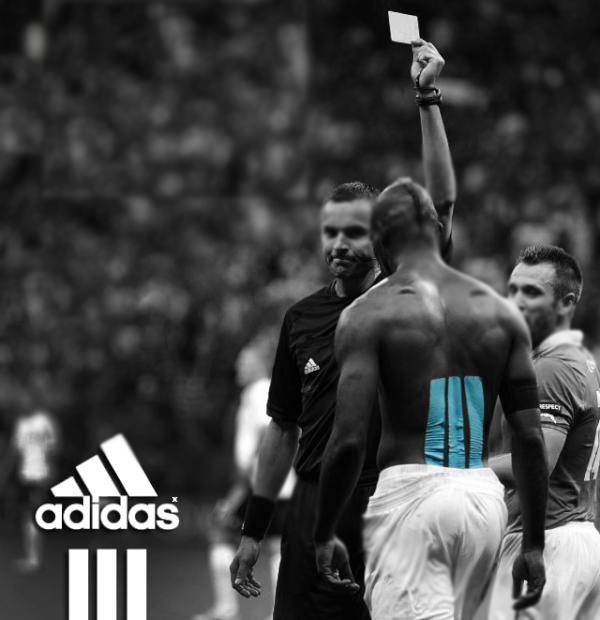 The extent of exposure to advertising on a daily basis has made out filter out the messaging – as you said, official sponsor ads start to look the same after a while. 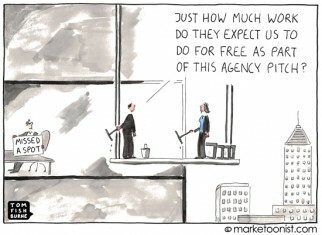 Therefore ambush marketing, by forcing marketers to be more creative and unusual, grab our attention. 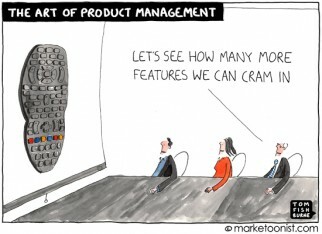 It’s what marketing should be – relevant (ideally), but unique. The rest just turns into white noise after a while. This reminds me of a brilliant campaign in the run-up to a cricket world cup in South Asia. Coke paid hundreds of millions of dollars to be the ‘official sponsors of the world cup’, but Pepsi totally out-manned them (and at a fraction of the cost!) with a “nothing official about it” campaign that used many of the star players on both sides of the border, and confirmed Pepsi’s status as the ‘drink of the young generation’. Even though Pepsi had 85% market share, they came off as the challenger, and made Coke look like a fuddy-duddy brand in the eyes of the youthful audience. Absolutely incredible! Let’s hope we also see Paralympians rocking Beat headphones shortly! Part of me is thinking, “no fair – the other brands are spending so much money sponsoring the Olympics”, but then I’m thinking, “So? Why are they wasting so much money sponsoring the Olympics instead of spending it on research or better products or disadvantaged kids?” I like that brands like Nike are saving the odd million for the entry fee into the Olympic pool and investing it in clever ideas instead. All three of my elementary school aged boys are talking about “cool headphones like Michael Phelps and the other swimmers have” (apparently more impressive to the younger crowd than the medals being won) and have added them as the beginning item on their Christmas list. I haven’t heard the same thing about another product. Ok, except for my 5 year old…who wants anything with an 800 number in the commercial. Of course it also is good to remember that, like in the case with Beats, it starts with an exceptional product and brand that people will jump (and run, swim, and do flips) for the chance to own and use. This comes up for trade shows, too — you can spend big bucks on your own booth, space rental, collateral, travel, lodging, staff time, and more… or you can send a couple team members as attendees to actually meet people, at a lower cost and without the artificiality of meeting people at Your Booth. I think Nike beat The Beats at the same game without even considering the ads. Has anyone else noticed that key athletes from all around the world are sporting BRIGHT YELLOW Nike shoes? You see them pop up in most every sport (whether or not they match the uniform of their country or even the shoes of others on the same team), and the popularity of the can’t-be-overlooked-color can’t be a coincidence. Great cartoon. Marketing is, after all, meeting the consumer needs – which needs to start by having a great product and getting the word about it out there. If official sponsorships are not doing it anymore (part because the products are not so relevant anymore, i.e., McD food and athletics don’t really match, part because the way they are trying to get the word out is old and stale), then hurray for creative options, call them ambush or nimble. Completely disagree with John Pierce above – it is great to celebrate creativity, it keeps the world turning. “Parasites” spur evolution! Some folks at my workplace (3M) were asking me why we do not sponsor the Olympics – and my answer was: do you have anything remarkable to say? If you can’t answer that question yet, go back to the drawing board. Yet again, your brilliance comes through in simple visual. The numerous big sponsors speak to a very broad audience but they are stuck in the sea of sameness. So it becomes who speaks loudest verus those that connect with a core target audience. The Beats is an example of a brand/product that is striving to be REMARKABLE and integrating themselves into the story of the athlete vs. being the one that shouts loudest and most often to the viewer. The Beats made the tough choice to be selective on who they are, who are they speaking to, and in turn how they should speak to their core target. What I admire most about the headphone strategy is that they found a need (that wasn’t seen by anyone else as a need) and filled it. People give away stuff all the time with a wide range of logo enhanced materials. Nike’s commercial is just another ad, putting a spin on product because they weren’t the official sponsor. Clever, but not amazing. But it’s when a need is filled (especially when no one else recognized it as a need), that’s when it becomes truly effective and people become brand ambassadors, even unwittingly. Whoever identified the need/desire for the headphones (to cancel noise, to energize the athletes, whatever the reason), that’s the true genius at work here. Without that need, we wouldn’t be talking about them. Bravo for recognizing these efforts. There is room for offical sponsors and for those with great products and brands to be seen and heard. Just as the real winners of the Gold Rush were those who provided the tools for the miners (Levi’s) and in the internet bubble of the 90’s it was the infrastructure part that outlived the dot.coms (Cisco), being in the right place at the right time satisfying a customer need is paramount. Creating a campaign or activity that provides exposure at the right time is brilliant. Focusing on support for the athletes in a product category not usually considered athletic is fantastic. Panasonic is the official brand? Maybe they should have thought about placing high end headphones on every athlete’s head. 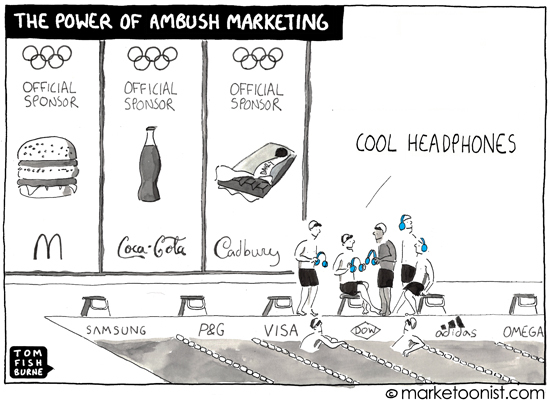 Ambush works when the sponsor brand is out-marketed. How many runners have you seen in the yellow Nike shoes? What is on TV, the wall of the stadium or the close-up of the athlete and their apparel? Clearly define your position, your strategy, your execution on how to get your brand on camera. By the way, I believe Beats cost more than the actual cost of the silver or bronze medals? I think it also speaks to the fact that people like “free stuff”. Young and old, rich and poor, olympians or not. And if its unique and cool all the better. We have a shirt that we have given out to people promoting our new carbonated drink (HINT Fizz). She shirt simply says “Fizz is the Shiz”. Can’t keep it in stock. There has been a very keen “Brand Police” marching around the UK stopping businesses even mentioning the keywords copyrighted for the 2012 Olympics in addition to the standard ones. So it is great to see smaller guys get one over the big guys when it comes to clever marketing! We all zap TV ads with our TIVO or DVR, but like so many others I noticed Olympic swimmers with the distincitive Beats headphones. Subtle promotion in unexpected places is less annoying and can reach the consumer. This is an inspiration to marketers to look for new ideas. Anything less is a lost opportunity. The Beat and Nike continually demonstrate that the product is the marketing. Regardless of how much money you spend on advertising (or don’t) having a good product that people want is the biggest component of a marketing campaign. Looks like… they forgot about Dre. People don’t realize that Nike is not an ambusher of the Olympic Games– they have official sponsorships with individual athletes and with National Olympic Committees to be the official supplier of clothing (including those amazing yellow shoes!). My broader point is that I’m not against creativity in marketing nor thinking outside the box, but rather when a company purposefully seeks an advantage at the expense of a company that has invested millions in a property (like the Olympic Games), they are parasites, bad people, etc. If they were so clever, they would find a way to promote their products outside of the event they decided not to sponsor. When companies ambush official sponsors, they take food off the table of the participants (in this case athletes). Simple. Wow, I’m humbled by your thought-provoking comments last week. This was one of my most widely read and shared posts over the last 6 months. I hadn’t heard the “parasite marketing” expression before, but I appreciate the sentiment from John Pierce. I am sure there are examples of ambush marketing taken to that extreme. Like Bill said, beware the excesses. Beats struck the right chord in my opinion. The impetus is on marketers to navigate this and decide which rules make sense to break. There are creative loopholes to find. This week’s print goes to Jon. I think he tapped the real genius in the Beats campaign. They found a need that wasn’t seen by anyone else as a need. They then filled that need with great execution. They outmarketed Panasonic, the official sponsor. Fancy though, but as I saw the Olympics, and noticed that they were wearing some headphones, I never knew the brand name…? And, never bothered to explore. I think this article of yours did all the marketing for me, as without it, the sampling was already history without the brand name getting introduced/forget about getting mind share. Beats and Nike both had the right idea for the modern audience. There is value in major sponsorship of events like the olympics but there are specific market segments that this does not reach and who react better to the subtle approach. Also someone using a product they appear to like is a much better promotion than a big name saying buy brand x.
Paddy power had a good poster campaign that got through the rules as well. They claimed to be sponsoring the biggest sporting event in London this year. Of course it was an egg and spoon race in London France. I got a demo pair and like them.